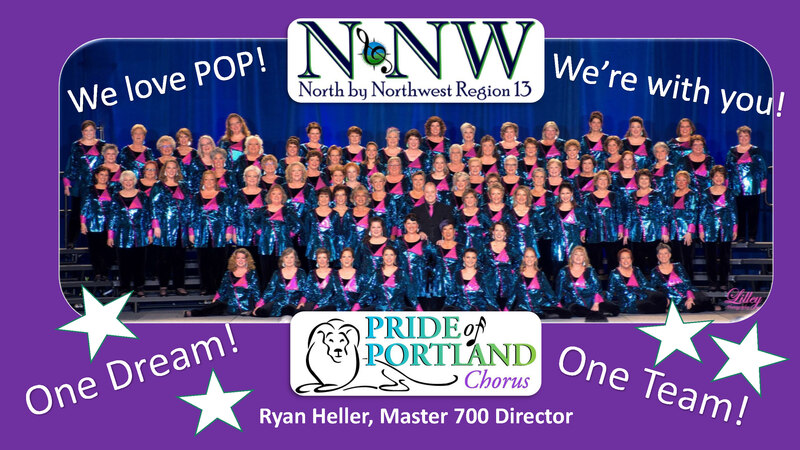 We are a diverse group of women from AK, ID, MT, OR, and WA who sing, perform, and champion a cappella music! The 62nd North by Northwest Region 13 Convention and Contests was held April 4-6, 2019 in Spokane, Washington! We had three amazing days together, fill with exciting events, joyous celebrations, and two great contests. Our congratulations to Wink Quartet and Pride of Portland Chorus, who respectively won the Quartet and Chorus Contests. Congratulations to all competitors! For results and scoresheets, please click here. 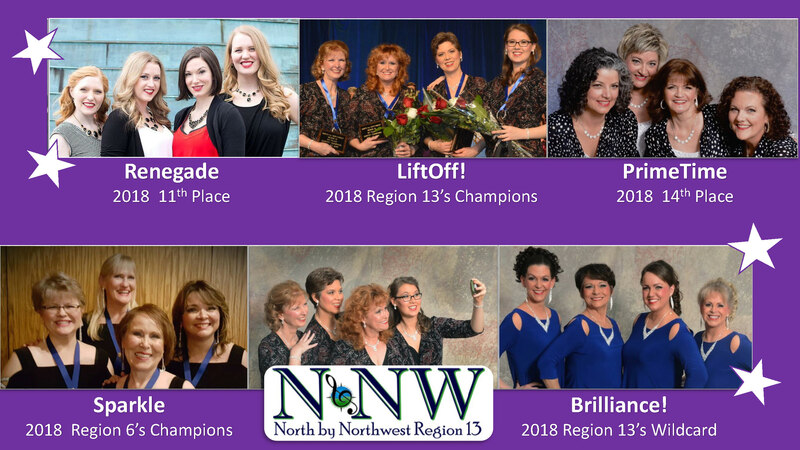 North by Northwest Region 13 is an extraordinary group of women who gather together in celebration of the art form known as barbershop music. We are one of 24 regions in Sweet Adelines International, and our particular region covers 28 choruses and over 45 quartets located throughout Alaska, Idaho, Montana, Oregon and Washington. You can see where we all are by clicking to see our regional map! Feel free to explore our site! Whether you wish to find a chorus to visit, want to hire a quartet for a celebration, plan to attend a show or workshop, or just enjoy some photos and videos, it's all here. The 2018 Sweet Adelines International Convention was held October 15-20, 2018 in St. Louis, MO. Exciting things happened all week; maybe you were lucky enough to be in attendance! Region 13 is extremely proud of the SEVEN groups who represented us this year: Pride of Portland Chorus, LiftOff! Quartet, Renegade Quartet, PrimeTime Quartet, Brilliance Quartet, and Sparkle Quartet. And, of course, Frenzy Quartet, the 2017 Sweet Adelines International Quartet Champions, was on hand throughout the entire week. Inland Harmony Chorus Show - "Sing and Celebrate"
Northwest Harmony & Bridge Town Sound BHS Chorus - "Harmony Helping Friends"
Pride of Portland's First Ever BUNCO BLAST FUNDRAISER! North by Northwest Region 13 is a cutting-edge group of diverse women singing, performing, and championing a cappella music.